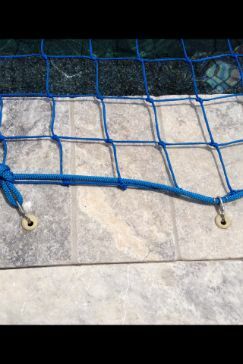 Close Up View of Pool Safety Net Installed. 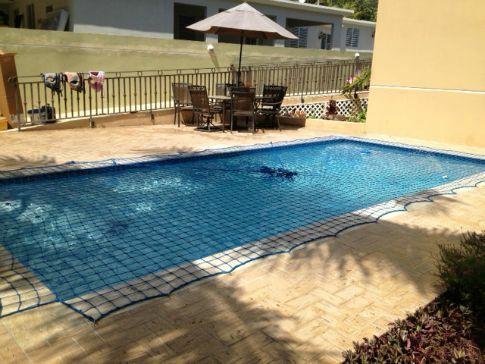 Pool Safety Cover with additional Pool Safety Net. A Pool Safety Net makes your pool safe for Children. A Pool Safety Net does not block your view. Pool Safety Net being installed. 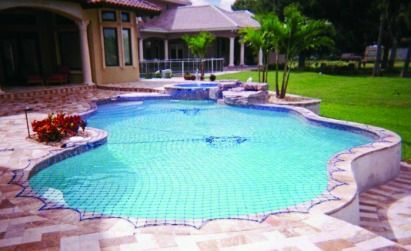 Pool Guard of the Gulf Coast offers pool safety nets manufactured by Pool Guard in several colors. Blue (by far the most popular), Beige and Black. The color selection truly depends on what color components are coinciding with the backyard (swimming pools with dark blue bottoms coordinate better with a black pool net and swimming pools with aqua blue bottoms coordinate better with blue pool safety nets). 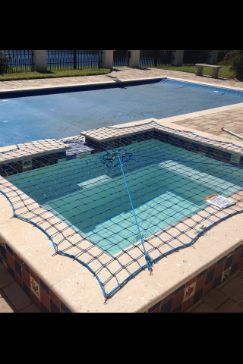 Pool Guard in Pensacola, Florida uses pool safety nets that are made from polypropylene. 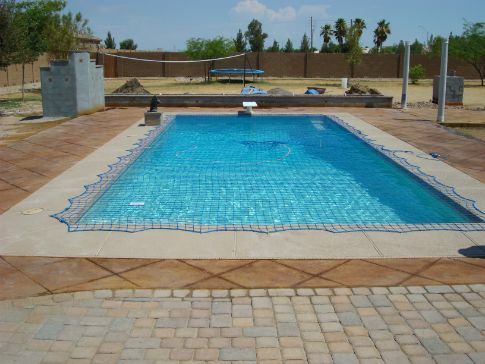 Depending on the size and shape of the pool, one or two CTS (Central Tensioning Systems) may be required. The CTS is the pulley system that is built into the net in key locations to optimize the ability to pull the pool safety net tight. 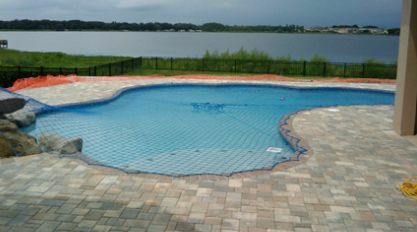 Pool Guard uses Barton™ (www.bartonmarine.com) as a supplier for pullies on their CTS system. 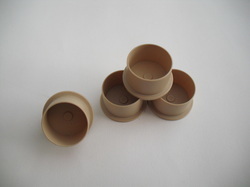 These pullies are designed to be on or near water and are truly built to last. The anchors used to hook the pool net to in the deck are polypropylene as a standard and Pool Guard of Gulf Coast offers the option of a brass anchor in the event the customer would prefer that as their anchor system option. Each pool safety net comes with a “key” as well as the pulley system to set the CTS on the net. Once the system is set in place, the net is “piano string” tight. 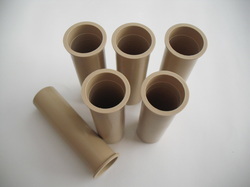 Storage of your pool safety net can be done using the pool net roller. We recommend this tool (available for purchase) as it makes taking off the pool safety net and putting the pool safety net back on much simpler. 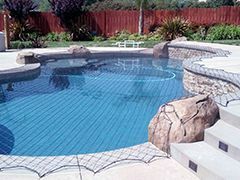 The time that it takes to install a pool safety net by Pool Guard of the Gulf coast depends on the complexity of the pool (if there is a waterfall, ladders or a grotto) however the average time is usually 6 hours. Once it is installed, the owner of the pool can take the pool safety net off and put it back on in a matter of 15-20 minutes.